The Giordano RS700 Hybrid bike is designed to tear through jagged terrains while ensuring the rider remains comfortable all the way. It is engineered with specific bike parts that make both riding and purchasing a walk in the park for the cyclist. This Giordano RS700 Hybrid Bike review provides an in-depth look at the features, as well as tips to make or break your purchase decision. The handlebar is conveniently flat and connected to equally flat handles. How is this helpful? It ensures you maintain a healthy back posture and even makes gear switching simple and fun. A Flat handlebars also ideal for the avid fitness trainers or the daily commuter. 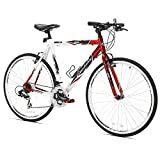 The entire frame of the Giordano RS700 Hybrid bike is manufactured from quality aluminum for durability. If you are thinking longevity, then this should be your pick. The best bike features a 21 speed Shimano drive and Shimano rear and front derailleurs. It’s this precise technology that makes gear shifting feel natural and seamless, and it’s also quiet on the road. The Giordano RS700 Hybrid is a balanced blend of red, white and black. It’s the rich color palette that will first attract the buyer to this road bike. The seat can be adjusted height-wise to suit anyone who is 5 feet or 6 feet tall. To fasten the saddle to the aluminum frame is a high-quality alloy black seat clamp. This Giordano Hybrid bike is reinforced with steel for extra durability and steadiness when riding. The headset, handlebar, stem, and forks are all crafted from pure steel. The saddle and seat post are made of steel as well. Quite cheap to purchase compared to other hybrid bikes with same features. The bike is easy to assemble and disassemble with a provided manual guide. A highly versatile hybrid bike for men; can be used for exercising or commuting to work. The aluminum body frame is sturdy enough to hold the rider’s weight and is quite durable. The colors used are quite attractive for a bike meant for riding through the woods or to work. 21-speed drivetrain provides the much-needed tenacity and extra handling as an exercise bike. Poorly done decals distract the eye from the bike’s aesthetic features. The seat is poorly constructed and most buyers opt to upgrade to better options. Generally a large bike thus people below the height of 5 feet may not find this a comfortable ride. If not assembled well, the rider may experience squeaking while breaking or pedals with a poor clearance. The demerits notwithstanding, the Giordano Hybrid RS700 bike is an excellent choice for the wallet watcher. It is built from pure aluminum and quality metal alloys that give it a sturdy durable frame. It provides the extra handling needed by the pro cyclist or fitness enthusiast. What about the downsides mentioned? Well, there is nothing that a professional bike handler cannot fix. As a matter of fact, it is advisable to have the bike assembled in a bike shop to avoid issues like squeaky brakes or reduced pedal clearance. One last but important point, RS700 Hybrid Bike Under 500 comes in different sizes, thus make sure to order the right size on your height.